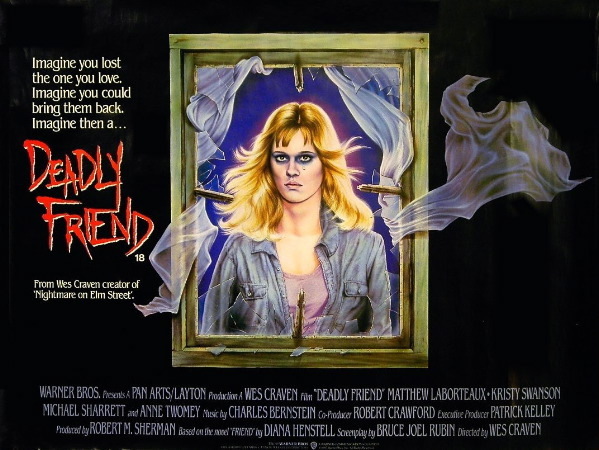 We can only speculate what made Wes Craven turn out a movie as terrible as Deadly Friend. Here’s a guy who just came off the wildly popular A Nightmare on Elm Street, and decided to take on a movie about a killer cyborg next. I mean yeah, that’s a vague description. And you could argue it’s not a dealbreaker, as there have been good movies about killer cyborgs. Terminator and all that. Deadly Friend however squanders its potential from the second minute, when it introduces a robot that sounds like Harvey Fierstein and looks like the Transformers‘ Bumblebee’s retarded brother. If anyone was planning to write fan fiction about Bumblebee & Fierstein’s love child: your dream is dead. Now this robot you see was made by some whiz kid who… ok, so I had some drinks when I put this on and am actually writing this under the influence. I don’t want to encourage drinking, but DO NOT WATCH THIS MOVIE SOBER. There’s a few moments where you’re like “wait, what?” and if I was sober and could actually contemplate all of this I would just destroy my brain trying to figure it all out. See, 80s movies are a strange thing. There was a lot of cocaine going around during these times and to make some sense of it all you’d better be under the influence as well. Or you go all in and say no to everything, including 80s movies. You man up, look Mannequin straight in the eyes and go “you and me, we’re done”. But yeah, this kid has built a robot apparently, so that’s cool. I once built a Lego castle when I was 10 but my dad was like “oh you just got that from the instructions” so I never got a movie made about me. But let me tell you: it looked way better than what was on the box, and it didn’t sound like Harvey Fierstein. Anyway, don’t make robots. Just don’t. If you do they will turn on you. Movies have been telling us for almost 100 years not to make robots (Metropolis fans, re-pre-sent) yet there’s still Japanese jackasses making these things in so they can sell them to foreign business men who want a robotic hand to jerk them off. Be careful, your happy ending might lead to your demise. Anyway, this wasn’t good. I wouldn’t watch it. I loved this movie so much but I know that there are going to ether be big fans of the film or haters of the film but I love it so much that if they ever made a reeked I would try out for Samantha and I would get the part because I know almost every scene but heart and I’ve only seen it twice. But I love this movie so so so much.